The Mountain Goat (Oreamnos americanus), also known as the Rocky Mountain Goat, is a large-hoofed mammal found only in North America. Despite its vernacular name, it is not a member of Capra, the genus of true goats. It resides at high elevations and is a sure-footed climber, often resting on rocky cliffs that predators cannot reach. The mountain goat is an even-toed ungulate of the order Artiodactyla and the family Bovidae that includes antelopes, gazelles, and cattle. It belongs to the subfamily Caprinae, along with thirty-two other species including true goats, sheep, the chamois, and the musk ox. The mountain goat is the only species in the genus Oreamnos. The name Oreamnos is derived from the Greek term oros (stem ore-) "mountain" (or, alternatively, oreas "mountain nymph") and the word amnos "lamb". Both male and female mountain goats have beards, short tails, long black horns, 15-28 cm in length, which contain yearly growth rings. They are protected from the elements by their woolly white double coats. The fine, dense wool of their undercoats is covered by an outer layer of longer, hollow hairs. In spring, mountain goats moult by rubbing against rocks and trees, with the adult billies (males) shedding their extra wool first and the pregnant nannies (females) shedding last. In the winter, their coats help them to withstand temperatures as low as -50 �F (-45.6 �C) and winds of up to 100 mph (160 km/h). A billy stands about one meter (3 ft) at the shoulder to the waist. Male goats also have longer horns and a longer beard than nannies. Mountain goats typically weigh between 45 and 136 kg (100-300 lb); females are usually 10-30% lighter than males. The mountain goat's feet are well-suited for climbing steep, rocky slopes, sometimes with pitches of 60 degrees or more, with inner pads that provide traction and cloven hooves that can be spread apart as needed. Also, the tip of their feet have Dewclaws that are sharp to keep them from slipping. The mountain goat inhabits the Rocky Mountains and Cascade Range regions of North America, from northern Washington, Idaho and Montana through British Columbia and Alberta, into the southern Yukon and southeastern Alaska. Its northernmost range is said to be along the northern fringe of the Chugach Mountains in southcentral Alaska. Introduced populations can also be found in such areas as Wyoming, Utah, Nevada, Oregon, Colorado, Texas, South Dakota and the Olympic Peninsula of Washington. Mountain goats are the largest mammals found in their high-altitude habitats, which reach elevations of 4,000 meters (13,000 ft) or more. Although they sometimes descend to sea level in coastal areas, they are primarily an alpine and subalpine species. Throughout the year, the animals usually stay above the tree line, but they will migrate seasonally to higher or lower elevations within that range. Summertime migrations to low-elevation mineral licks often take them several or more kilometers through forested areas. 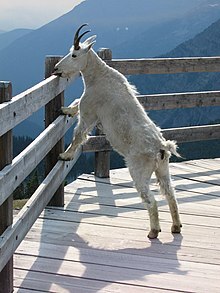 Young 'goat' licking handrail for salt. Daily movements by individual mountain goats are primarily confined to areas on the same mountain face, drainage basin, or alpine opening. Daily movements reflect an individual�s needs for foraging, resting, thermoregulation and security from predators or disturbance. Seasonal movements primarily reflect nutritional needs (e.g., movements to and from mineral licks/salt lick), reproductive needs (i.e., movement of pre-parturient females to "kidding" areas; movement to rutting areas), and climatic influences (i.e., movement to areas in response to foraging conditions). In general, seasonal movements are likely to exhibit a strong elevational component, whereby lower, forested elevations are used during the spring-summer (security cover effects) to access lower elevation mineral licks, and during winter (thermal cover effects) to access forage. The farthest movements are expected to be by dispersing mountain goats. Such movements are likely to involve mountain goats crossing forested valleys as they move between mountain blocks. Kids are born in the spring (late May or early June) after a six month gestation period. Nannies give birth, usually to a single offspring, after moving to an isolated ledge; post-partum, they lick the baby dry and ingest the placenta. Kids weigh a little over 3 kg (7 lb) at birth and begin to run and climb (or attempt to do so) within hours. Although they are mostly weaned within one month, kids follow their mothers closely for the first year of life (or until the nanny gives birth again, if this does not occur the next breeding season); nannies protect their young by leading them out of danger, standing over them when faced by predators, and positioning themselves below their kids on steep slopes to stop free falls. Mountain goat are herbivores and spend most of their time grazing. Their diet includes grasses, herbs, sedges, ferns, moss, lichen, twigs and leaves from the low-growing shrubs and conifers of their high-altitude habitat. In captivity, the mountain goat's diet can also include grain, alfalfa, fruits, and vegetables. Oh yeah and the occasional tin can. theMountainGoat can also be found in his natural habitat of Basingstoke in the United Kingdom where he spends his days sat behind a computer screen working on websites like this one. He currently works for Nature Magazine as a web production editor which is his primary grazing grounds for the Westeros Forum. While the name may seem like an unholy alliance of two of GRRM's most notorious bastards, it is in fact a nickname he has had for many years before and comes from hiking because MG walks as fast uphill as he does on the flat without seeming to tire. theMountainGoat is a Knight of the Mile High Tomato Pie and was knighted by George R.R. Martin at Worldcon 2008 in Denver, Colorado, USA.